Transport expert and educator, Paul Mees, sadly passed away less than a week after he made this video message to be played at the Trains not Toll Roads Campaign Launch on 13th June, 2013. He was always a good speaker: easy to understand and direct - a straight talker. So have a listen - what are his reasons for describing the East West Tunnel as a Mad Scheme? On the second last sitting day of the Australian Parliament, the Labor Party voted in Kevin Rudd as Leader again. 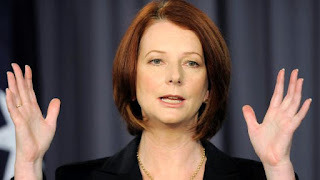 Julia Gillard was deposed from the position - she was ousted from the job. You can read along with the transcript as she makes her resignation speech. Here is the video and transcript.